I need this document translated, and the translation is to be of high quality. submit the document tomorrow, please have it checked and translated for me today. I have deposited $150 to your credit card account that you gave me the last time. Let me know if any questions occur. P.S. 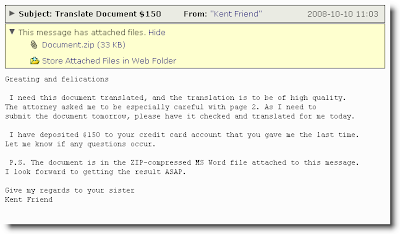 The document is in the ZIP-compressed MS Word file attached to this message. I look forward to getting the result ASAP.